We have many ways for you, your family or your company to make a major impact in your community. We have limitless opportunities for you to connect with people in Greenwood and make it a great place to live and work.Contact Jane Weisenbach to discuss what kind of IMPACT you want to make and what legacy you or a loved one, want to provide to the people of Greenwood. Jane can be reached at (317) 881-1953 or her direct telephone number (317) 883-4249 or jweisenbach@greenwoodlibrary.us. The family of W.J. 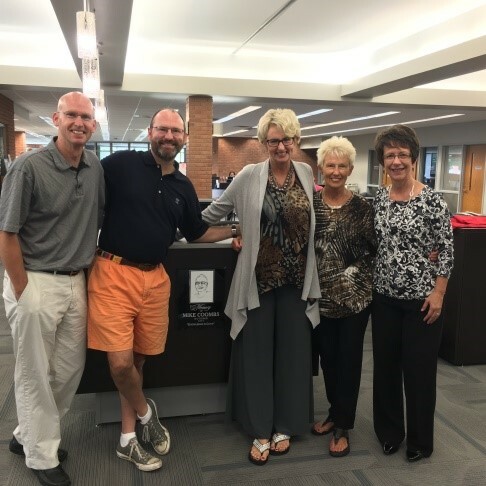 “Bill” Fisher have generously donated money to the Friends of GPL in his memory and a special project was commissioned in 2008 to beautify the library that he loved. He was a frequent visitor to the library where he continued to pursue his enthusiasm for lifelong learning. “Pop” as he was also known, raised his two sons and one daughter in Greenwood with his wife “Bunny.” He was a naval aviator, veteran, businessman, loving husband and father and an active member of this community. His love of nature and the outdoors was reflected in a beautiful waterfall at the entrance to the Library and has now been transformed to a child friendly, interactive, bubbling boulder where families can relax and enjoy the space. 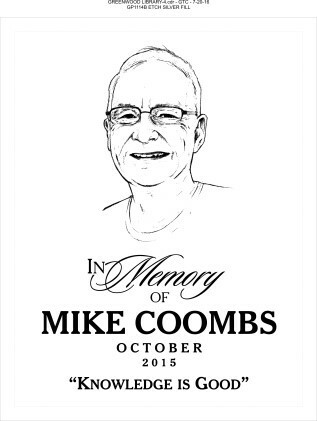 Memorial gifts for Mike Coombs were donated to the Greenwood Public Library and used to help create and install a new reference desk in the Adult Reference area. A plaque bearing his name and likeness quotes one of his favorite sayings: “Knowledge is Good”. Mike was a frequent visitor to GPL often seen with a grandchild by his side. His daughter said they had a “circuit” when he had her son with him: the golf course, lunch, the Greenwood Public Library, then on to Mrs. Curl. Memories are made here at GPL and we appreciate hearing your stories and the gifts we receive in memory of your loved ones.